- combine all ingredients to form a soft dough and leave to rest for 1/2 hour. Then divide into 60gm dough each. You can roughly get 15 pieces. - at the same time, divide homemade mung bean paste into 60gm each too. - wrap the mung bean filling with the pastry dough and arrange to the baking tray. - no egg glaze needed in this recipe. - bake at 200'c for 10 mins and then 180'c for another 10 mins. wow,so delicate with rose petals! 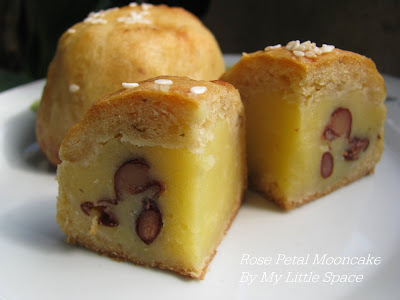 Wow...that's so creative....rose petal in moon cakes....romantic...haha. Love that you mixed red beans into the mung bean paste....makes the filling looks special and beautiful when cut. I'm so lazy to make moon cakes....looks like so much work....hmmm. Wish I can have some of yours...hehe. But it looks like lots of fun to make, too. So, may be I will try :D Have a lovely weekend, Kristy! You made so many types of mooncakes, wonder how you finished them all? 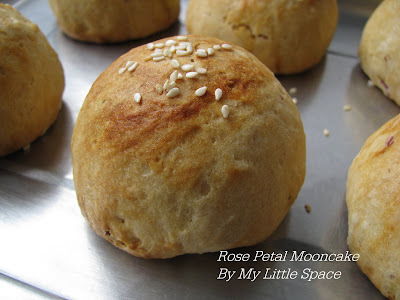 This rose petal mooncakes is another very interesting flavour! Oh Just bought a mooncake to send to my mum who has never had one before :), looks delish. And no we dont celebrate muslim new year next week its hari raya or eid which is a day to mark the end of the fasting month. Rose petals and moon is very romantic Kristy!Will you permit me to call this honeymoon cake (haha)! They look so cute and yummyilious! Jess : Good that you know them now! It's a good experience after all. MaryMoh : Haha... Romantic mooncake! Not bad not bad! Jeannie : I sent most of them home to my mom and gave some to my nearby friend & neighbour. So, just left a few for ourselves. Sharing is good, right! haha... So, what do you think about the bean paste? Holding well? Sutapa : Honeymooncake! Hey, that's a great name for this cake as well. haha.... Thanks alot. Thanks very much everyone for spending your weekend here with me today. Hope you're all enjoying your day & have fun. Your mooncakes are beautiful and all totally handmade...!! Good job! Rose petals in mooncake dough...that's unique! Nope! Never seen on this before. You are always so creative! One day I am going to make one of these beautiful mooncakes, they are just so pretty. The rose petal idea is wonderful. What a unique mooncake! Your mooncakes are always so pretty! So creative in your cooking. I love the name mooncakes! Interesting.. must try and get hold of dried rose petal. Oh this is another of your genius creations Kristy! How cute are those? I have never baked with rose petals, but will try. I love rose water and flavoring so I know I would adore these adorable round cakes! What an interesting recipe using the rose petals. I would love to taste this. you are simply amazing as your creations fabulous! These are gorgeous Kristy! You make the best mooncakes! Love the rose petals in this one. I love roses in anything - I have pots of roses growing outside my window and love looking at them bloom! This is a wonderful idea - so original and so beautiful! Kristy, you've done it again, another creation! can i know where to buy the rose petals or pluck from the plant. is there any process before we use it for baking. i am new in baking. appreciate if you could let me know. thanks. First of all, thanks so much for stopping by my humble little space. Now, to your answer, you can get those rose petals or dried roses from any tea specialty stalls or chinese medical hall or you may find them at pasar malam as well. Hope this will help. Have a blessed day.